Libby arrives to see Darren. She's had a bad exam but only has one more. She asks Darren to take her out for coffee but Darren has to mind Lolly, and his back is still bad; Ruth is coming over to give him some treatment. Libby teases, saying she's not sure she likes the idea of Ruth making personal house calls to rub her hands all over his back! Darren suggests dinner tonight instead. Lou is trying to persuade Ben it's just nerves and not to throw everything away. Ben says he's just not cut out for it and walks off. 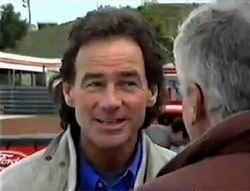 Motorcycle racer and racing commentator Barry Sheene comes up and says, "Woody? It is you!" Lou says he hasn't been called Woody in years. It's been about 15 years since they last saw each other. 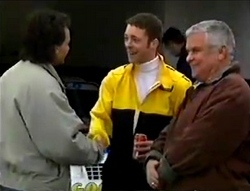 Lou tells Barry about Ben's racing. Ruth finishes a phone call to Bill and tells Anne and Lance that their father is getting re- married. They are all surprised but Ruth is OK with it. Bill wants them to go to the wedding and wants Anne and Lance to be part of the bridal party. Anne thinks she'd make a good bridesmaid but Lance isn't happy. He thinks Bill just wants them standing next to him so he looks like a model father. Ruth isn't going to make him go but thinks he should consider it. Ben returns with a Coke and apologises to Lou. He hasn't changed his mind though; he's a mechanic, not a racing driver. Lou introduces Barry to Ben, who is a bit star struck. Lou tells Ben that he and Barry used to go motorbike racing together; he taught Barry everything he knows! Ben questions the "Woody" nickname and Barry says wood is what carpenters work with. He tells Ben he knows enough stories about Lou to sink a battleship. Sarah is on the phone to Matt, upset that he's not coming back this weekend. Matt says there's something on every weekend so perhaps they should put things on old until he moves back. Sarah asks when that will be but Matt doesn't know; he likes it where he is. He doesn't want to stay for good but maybe for a while. He wants to stay friends. Sarah pretends someone's just arrived and says she's got to go. Ruth is setting up her table while Darren makes cups of tea and Libby teases him, asking if he's nervous yet about having Ruth rub her hands all over his body. She asks where her tea is but Darren says she won't be staying. Ruth says it doesn't bother her, but Darren tells Libby to go. Libby leaves and Ruth asks Darren if she detects a bit of nervousness, which Darren denies. RUTH: So, take your clothes off and hop up on the table. Darren takes his tops off but Ruth tells him he'll need to take his jeans off too since it's his lower back. Darren does so, awkwardly. Barry is checking the car and can't believe the work Ben did last night; being mechanically minded gives him a head start over the other racers. It's only experience he's lacking. He tells Ben he can do it. Libby has arrived and Sarah is complaining about Matt changing his mind all the time. She feels so miserable. Libby says she needs something to take her mind off of it. She will go and check on Darren then come back and take her out for a meal and a game of pool. SARAH: Lib... I can't play pool. LIBBY: Yeah, I have noticed! Lance is complaining to Amy about his dad expecting them all to come running when he wants something. Amy asks if she is invited to the wedding so she can buy a new dress but Lance says he's not going. Amy thinks he should be happy for his dad but Lance refuses to go and play happy families just to make him feel good. Ruth is packing up and Darren is fully clothed again. He tells Ruth he feels fantastic. Ruth tells him he still needs to take it easy otherwise she'll have to see him again tomorrow. If not, in a couple of days time. Libby returns and Ruth leaves. Darren tells Libby he's back and tonight's going to be great. Libby says she's offered to take Sarah out tonight but tells Darren he can come too. She assures him he won't be in the way and he can help her cheer Sarah up. 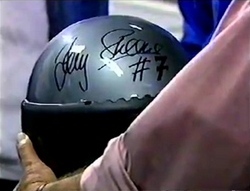 Barry gives Lou a signed helmet for the bar. Lou asks how they got on after he left. Ben says Barry gave him lots of good tips and he won't be quitting. Barry says Ben can phone him any time for advice. They open some beers. Sarah, Darren and Libby arrive and Sarah is still miserable about Matt. Libby suggests it wasn't meant to be. Darren says it would have been worse if she and Matt were really serious but Sarah bites his head off. Darren says he might leave them to it and gets up. Sarah tells Libby she was really serious about Matt but he obviously just didn't feel the same way. Philip is pouring some wine as Ruth tells him she doesn't know how to change Lance's mind about the wedding. Philip wants to know how Ruth feels about it. Ruth says she's been over Bill for a long time but admits he can still get to her. Philip says Bill moving on without her and the kids ends that part of her life; perhaps that's how Lance feels. Ruth wishes she knew how to make it easier for him. Darren is playing pool with Ben and picks up the extension rest because of his back but Ben makes fun of him so he tries it without. He hurts his back again and Libby and Sarah rush over. LIBBY: Darren, Have you done your back again? DARREN: No, I just like standing doubled over in agony! Ben apologises and Libby tells Darren he'll have to see Ruth again. Darren says he'll have to make an appointment for the morning. Lance is on the phone the following morning but Anne appears and he says he can't talk right now and has to go. Anne guesses that it was Toadie and wants to know where he is as people are worried about him. Lance says Toadie is OK and is planning to sit his exams in the city. Lance has promised not to tell anyone where he is. Toadie feels he let the Kennedys down on muck up day. Lance is going to get some stuff from the Coffee Shop and meet Toadie and refuses to let Anne come with him. Ruth is leaving after another physio session. Darren tries to help her carry stuff but Ruth tells him he's got to look after himself. RUTH [to Libby]: You might need to tie him up. DARREN: Ah, that sounds kind of appealing! RUTH: I don't want to know! Libby hopes Darren has learned his lesson and tells him he can't ignore his back pain, as she puts her feet up on him (because that will help). Libby thinks Darren should get something for Ruth to show his appreciation for her putting him ahead of her other patients. LIBBY: So what are we gonna do until my final exam? DARREN: Well, no twisting, no bending, and no pool, Ruth said. LIBBY: Great... maybe I'll just study! 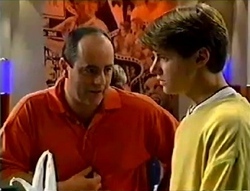 Philip comes in as Lance is buying supplies for Toadie and talks to him about the wedding; if he were getting remarried he'd hate for his kids not to be there. Lance says the difference is that Philip actually cares about his kids. Philip asks if they were never close but Lance says they used to go to the footy when he was younger, and one time they built a go kart together. Philip suggests Bill just handled the divorce badly but it would have been hard for him too. If Lance goes to the wedding it may help them get back on track. He says parents have doubts too. Philip and Lance have teleported to the house and Lance tells Ruth he's decided to go the wedding. Ruth thinks it is wonderful. Lance says he needs to go and see a friend now. Anne says she will go with him but Lance says it would be better if she didn't. RUTH: This all sounds decidedly cloak and dagger. What's going on? Anne says a friend from school is sick. She and Lance leave and Ruth tells Philip that she understands those two less and less. She thanks him for whatever he said to change Lance's mind. RUTH: We don't make a bad team, do we, when it comes to our kids? PHILIP: No, forget the kids, we actually make a very good team. We always did. Philip kisses Ruth on the cheek. RUTH: Does this mean we've sort of made up, officially? PHILIP: How official do you want to make it? RUTH: Well this'll do for starters.